I remember when I first saw pictures of the Fiat 500L several months ago. I thought it was quite the homely creature. It had tiny looking wheels, odd proportions, and a shape that looked as if it had melted a bit in the microwave. Not one to judge a car solely by photos on the interwebz, I decided to wait until I saw one in person to really make up my mind. Some of my other auto-writer friends that had seen the vehicle first-hand or had actually driven the car said that although its looks were peculiar, the interior was awesome and it drove pretty darn well. There is certainly more to a car than its looks, right? I mean, you can’t judge a car until you've driven a mile in its shoes … er … interior. So, I eagerly awaited my Fiat 500L loan for this article. EXTERIOR: How do you say ‘meh’ in Italian? When the vehicle was delivered, I took a long look at it and it just didn't click. It really does have odd proportions. It sort of resembles a Little Tikes toy car. You know, one of those all-plastic kids toys that is all rounded off so they can’t hurt themselves on it? It’s kinda like that, but with Fiat badges. Despite having 16” wheels/tires, they look like they’re about a 13” combo. Part of that is due to the tall fenders and smallish wheel wells. If you look at the car dead-nuts on from the front, the look isn't bad at all. It definitely looks European (final assembly is Kragujevac, Serbia with 19% of the parts coming from Italy, 21% coming from Serbia, and 60% hailing from parts unknown). However, as you make your way around to the side of the vehicle, things start to get funky. And not like James Brown funky; more like spoiled milk funky. And from the back, the first thing I noticed was the enormous 500L logo on the back, complete with a back-up camera mounted in the center of one of the zeros. (That, however, is pretty clever.) 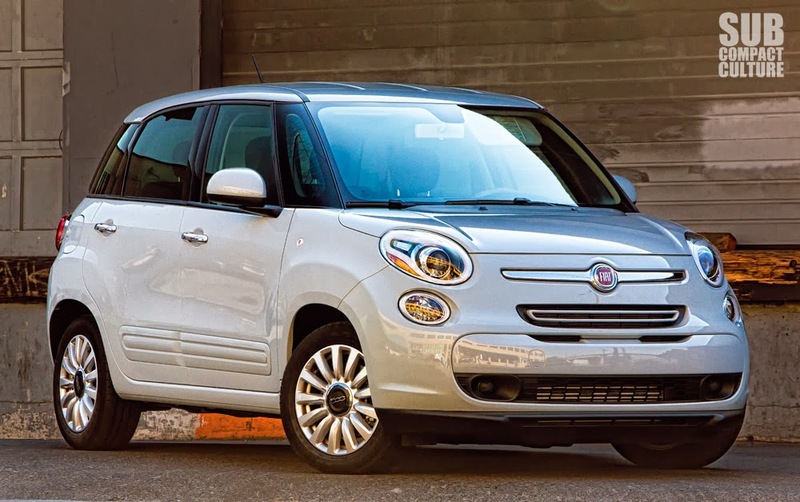 Unfortunately, even in person, the 500L isn't much of a looker. So, inside I went to see if the interior could help change the 500L’s first impression. 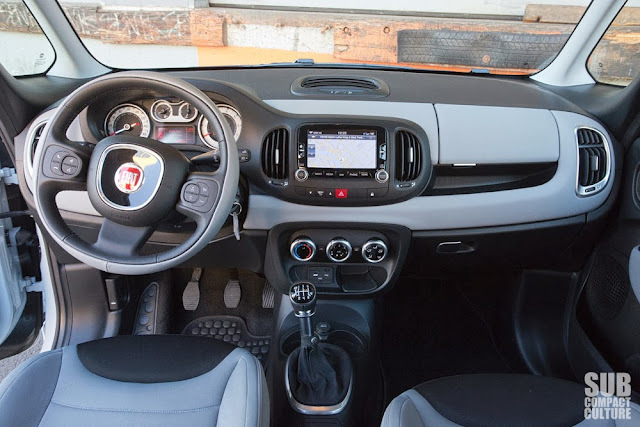 To my surprise, the 500L does indeed have a very cool interior. First off, it feels huge inside. Even without opening up the rear hatch or sitting in the back seat, I could tell that this was going to be one smartly packaged ride. And indeed it is. Up front the driving position is very upright, although it’s more comfortable than a regular Fiat 500. There is neoprene-like tuck-and-roll upholstery on the seats and parts of the dashboard and doors also get this wetsuit-like cloth. Although different, it works in the 500L. Move to the back seats and you’ll be welcome by ridiculous amounts of legroom. It’s like a damn limousine back there, albeit one with upholstery from a diving outfit. These seats also fold down and can tumble forward for more space. Open the rear hatch and there’s a spacious cargo area with a movable floor allowing for a configurable two-tier system that allows for versatile storage solutions. With the seats folded down, there’s tons of space to carry stuff. 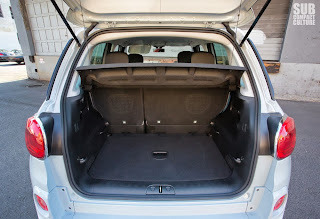 Coupled with the vehicle’s tall interior, the 500L could be a great cargo carrier. It’s a bit reminiscent of my old Mitsubishi Expo LRV, actually—a good thing. Moving to the front again, I have to mention the unique A-pillar glass. These wide glass window pillars aid in both making the interior feel airy and bright and keeping good sightlines around corners. They’re totally different, but the work well. Speaking of different, the emergency brake is unlike any I'd ever seen. It's a flat unit with the button on the side. Much like the A-pillar glass, it's different but perfectly functional. One of my few interior gripes is the visibility of the gauges. No matter how I moved the seat, no matter how I tilted the steering column, the top of the wheel would cut off part of the gauges. I never found a combination that provided a 100% clear view of the speedometer and tachometer. One other gripe, one that I have with the standard 500, is the shifter. While I’m extremely glad Fiat offers this car with a six-speed manual transmission, it’s not the epitome of precision. Throws are on the long side and action feels rubbery. And while it’s hard to show in photos, the shift knob resembles a snow globe, sans water and snowflakes. It’s a transparent plastic with the numbers printed on the bottom. Weird. Back to good stuff: The Uconnect infotainment system is excellent. Connectivity is simple and all the features you could want are available, including navigation. 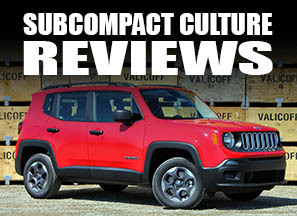 The six-speaker sound system is average, and the climate control is simple and effective. So while the exterior doesn't do much for me, my auto journalist cohorts were correct: The interior is very cool. 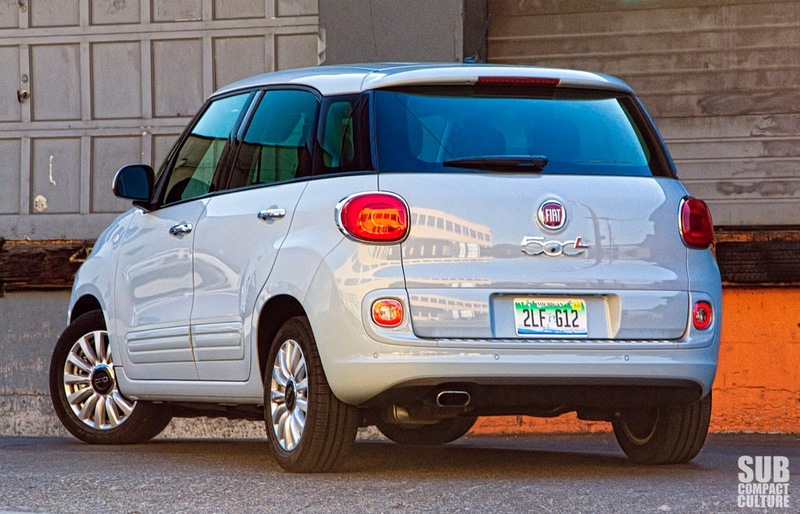 The 500L is powered by the 1.4-liter MultiAir four-cylinder engine, which is powering a growing number of Chrysler and Fiat vehicles. In the 500L it makes 160 hp and an impressive 184 ft/lbs of torque. Much like when we drove the Dodge Dart, the engine has a lot of turbo lag and has a distinct on-off feeling. There isn't much below 3,000 RPM, but after that the thrust really comes on. Keep it in the rev range and the 500L is remarkably spunky, despite the laggy turbo and 3,200 lb. curb weight. There are times where you wish there was a bit more grunt down low, however, and most passes need to be accompanied by a downshift. 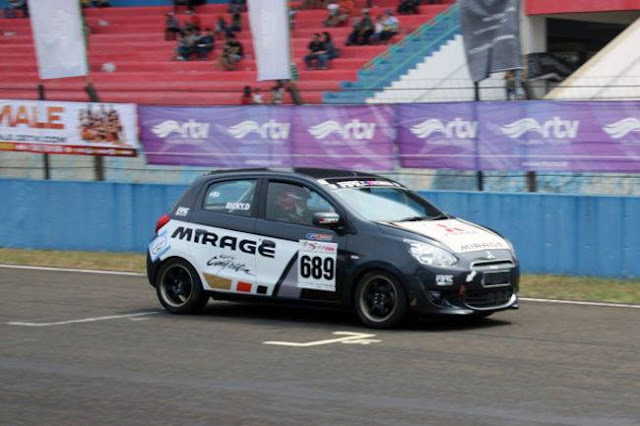 By the way, despite the car having a similar engine to the 500 Abarth, it doesn't sound nearly as loud. Frankly, if I owned this car, I’d try to give it the Abarth’s amazingly musical exhaust note; it’s awesome. Rated at 25 city, 28 combined, and 33 highway, I mustered a very achievable 30 MPG from the 500L in mostly city conditions on premium fuel. One of the biggest surprises to me was the way the 500L handled. Zoom around a cloverleaf and the car corners much flatter than expected. Understeer feels minimal and body roll is much less pronounced than one would imagine, especially when looking at this Italian tall wagon. In fact, I was damn impressed. It really could be driven rather hard and kept coming back for more. I can only imagine what it’ll do with some stickier tires, some lowering springs, tuned shocks, and a rear swaybar. You’d likely surprise quite a few more traditionally sporty cars, especially since the car looks a bit like it was carved from a bar of soap. In addition, the ride is very comfortable and notably quiet on the highway. Overall, the 500L is a rather attractive package. Well, “attractive” sans the actual looks of the vehicle. By the way, the Blu Chiaro (light blue) paint doesn't do the car any favors, either. I’d say it’s the least flattering of the 500L hues. I went on the Fiat website and built the car in a darker color, and it looked a lot better. In addition, I saw the two variants at the 2013 SEMA Show in the Mopar booth in Las Vegas, and they had both a lowered 500L and a lifted 500L, both with custom wheels, and the pair looked better than our light blue rig with the tiny-looking wheels. And just so you know, the 500L's wheels have a 5x98 bolt pattern, which is mainly (only?) used on Fiat and Alfa Romeo cars, so custom wheels are few and far between in the U.S. at this point. While the aforementioned handling was a nice surprise, the price is even more impressive: This ’14 500L in the “Easy” trim level retails for an incredibly reasonable $20,995 including destination. To me that seems like a downright bargain. While it ain't necessarily the most belle girl at the dance, that price is impressive considering you get a peppy turbo engine (albeit a laggy one), a ginormous and comfortable interior, navigation and a rearview camera; and other goodies such as hill assist, Bluetooth, the fantastic Uconnect system, and you can get it with a six-speed manual. If it was a looker, this car would be at the top of my list. Unfortunately, I still can’t say I like the looks. I do, however, like just about everything else about it. Oh, and the 500L is a direct competitor to another turbocharged ugly little duckling: The Nissan Juke. Remind me, how do you say "polarized styling" in Japanese? I still think it would look better with some wood grain side panels. The Cozy Coupe body lines and Chrysler heritage just scream for it. C'mon, it's really just a sleek, Italian mini van that handles better than most go karts.